I liked the location. The bathroom was very small. There was hardly any room between bathroom door and the toilet. I did not like that one tower has no climate control within each individual room. We had to switch rooms at 1am because the heat in the tower was turned on and our room became unbearably warm. the location is favorable to the airport. other than that, the room was a joke tucked back in an area on the second floor that is embarrassing and feels like a motel. In addition, I checked in and paid for a room with a king and only received a twin. One of the worst overall experiences with a hotel, in terms of the appeal of the room that I have had and I travel every month. The parking situation is confusing. They charge $32 to park for one night. Only one elevator worked. There was a half drank water bottle left in our room. Hotel was nice and the staff were pleasant, however, I had a vehicle parked for one night ($32) and my final bill showed three nights worth of charges for parking. First room they gave us was aweful. We walked in and the chemical odor was unbearable. We had to haul our luggage back down to the front desk and demand a different room. After several minutes, they conceded. The second room was much better than the first one. Nice hotel close to the airport . We took the shuttle they had to the airport that was very convenient. I enjoyed the hotel and staff vary much.. but i disliked the room. No view and no fridge. Poor lighting in the room. Vending machine was empty most of our trip. I would not stay at another Sheraton property. I recently stayed at a Sheraton in Atlanta during July and the facility was about the same. Horrible image of this hotel brand. I won't be spending my money with them in the future. I found the room and premises a bit outdated and the room had a particular odd odor. If booking s room here, request a room away from the stairway as people come and go the metal door shuts loud. The staff was friendly and the shuttle service was on time for early pickup. Great hotel if you don’t have anyone to take you to the airport for early flight. Safe travels!!! Very confortable hotel, nice room, big bed, big bathroom, very close to the airport, with free shuttle service, nice bar, very affordable, definitely i reccomend this hotel. 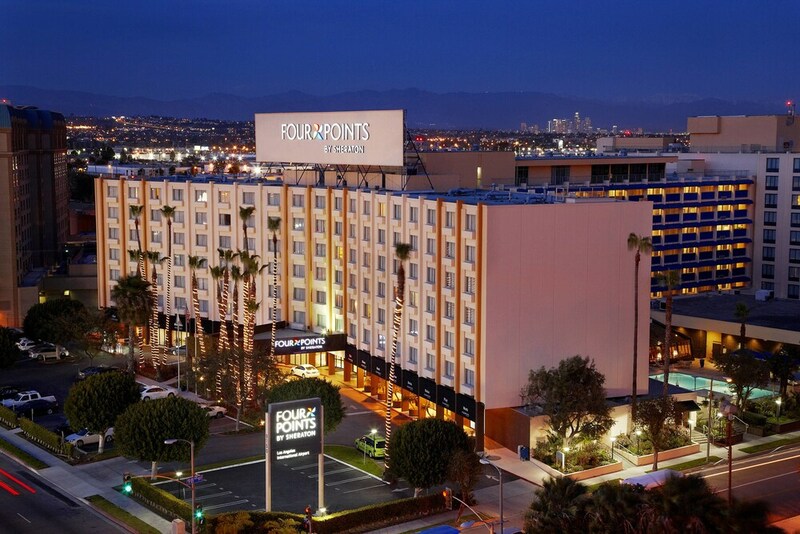 Located in LAX Area, Four Points by Sheraton Los Angeles International Airport is within a few miles (5 km) of sights such as Los Angeles Forum and Hollywood Park Casino. This 3.5-star hotel welcomes guests with 557 rooms and conveniences like an outdoor pool, free in-room WiFi, and a free airport shuttle. You can enjoy a drink at the bar/lounge or visit the onsite restaurant for a bite to eat. Savor a meal from the comfort of your room with room service, or get a quick energy boost at the coffee shop/café. For your convenience, a buffet breakfast is served for a fee each morning from 6 AM to 11 AM. Guests can expect to find free WiFi and 32-inch an LCD TV with cable channels and pay movies. Pillowtop beds sport premium bedding and the bathroom offers a hair dryer and free toiletries. Other standard amenities include a coffee maker, free weekday newspapers, and free bottled water. At Four Points by Sheraton Los Angeles International Airport, guests enjoy an outdoor pool, a fitness center, and free WiFi in public areas. If you drive, self parking is USD 32.00 per day, or you can take advantage of the free airport shuttle (available 24 hours). The front desk has multilingual staff on hand 24/7 to help with concierge services, luggage storage, and securing valuables. Additional amenities include conference space, a business center, and a computer station. Thank you for taking the time to complete the Guest Experience Survey. We are pleased to hear that you enjoyed your stay. It is our goal to provide our guests a magical and memorable visit. Thank you again for your candid feedback. In your shoes I would have been very upset and frustrated. I sincerely apologize that we didn’t get it right for you this time. I really do appreciate your comments and have already used them as a catalyst for improvement here at the hotel. Thank you again for your candid feedback. In your shoes I would have been very upset and frustrated. I sincerely apologize that we didn’t get it right for you this time. Recreation features at Four Points by Sheraton Los Angeles International Airport include an outdoor pool and a fitness center. The front desk is open 24 hours a day, and checking out is easy with express services. For convenient arrivals and departures, you can take advantage of the free airport shuttle (available 24 hours). Driving? This property offers parking (fees apply).